Orion can be advanced and its rez cost is lowered by 3 for each advancement token on it. And seeking prey he then took aim. This is not so much a review of Orion as it is a review of all space ice. Space ice or Asteroid Belt, Nebula, Orion and Wormhole to be precise, all have the advantage of being cheaper the higher they are advanced. A fully advanced piece of space ice can be ressed even when youve somehow been reduced to 0s. This is the first advantage of space ice, they can be operated cheaply. Instead of paying for them in one lump sum you can chip away at their price when it suits you. Space ice is strong, the weakest of the three, Nebula is still strength 5, Asteroid Belt is a respectable 6 (broken by Corroder for 5 per run or Cerberus "Lady" H1 4 per run) and Wormhole, the most interesting of the bunch (even including Orion) is strength 7 (broker by Gordian Blade for 6 or ZU.13 Key Master for 7). For ice that cost you only 3 to ress those are really good numbers. Orion has the disadvantage of being all 3 types, but its not considered a destroyer nor AP, which makes it immune to Sharpshooter and Deus X. This is the second advantage of space ice, it is strong and taxing. Space ice has a few extra good points that make it versatile. The advancement tokens stay on ressed space ice thus targeting them with Criminal de-ress cards is useless, furthermore those same tokens can be used to fuel Trick of Light if you are playing that kind of fast advance. Wormhole notably is the most versatile space ice, its subroutine can be used to trigger the effects of ice normally to weak to trigger some powerful subroutine (Neural Katana) or an exceptionally powerful routine from expensive or illicit ice (Heimdall 2.0 brain damage + end run, Checkpoint, Shinobi). Remember that Wormhole and Orions versatile routines are resolved after the runner has declined or failed to break it, you can surprise the runner by not ending the run on a remote server and doing some damage or utility instead, thus perhaps leading him to beleive that the server might not contain an agenda as he though and leave it alone for the rest of the game. If you do not have enough clicks to ress space ice when you need it, do not be afraid to ress it when its only halfway done, it may cost you 3-6 credits to ress a Wormhole but it's still worth it if you think the runner is going to run that server 2-3 times that turn. Also fun fact: If you have an Orion and Wormhole ressed, and the runner encounters and cannot break Orion, Orion will destroy a program, then you can use Orions routiene to resolve a subroutine elsewhere, resolve Wormholes routine and double up on Orions program trash. This is the third strength of Space ice, versatility, especially in the case of Wormhole. Space ice has some definite weaknesses as well. First among them is their slow speed. It takes 2-3 rounds to make a piece of space ice efficient, that requires you to have a lot of unspent lying around. If you have a lot of Space ice it becomes an impractical chore to advance it all, it is better to mix it with normal advanceable ice to better confuse your opponent and not be forced to spend too much time advancing ice throughout the game. Asteroid Belt especially can be replaced with Fire Wall and Ice Wall. A Fire Wall with 3 tokens can masqerade as space ice and still very efficiently stop the runner cold. Over time clicking space ice tends to replace clicking for credits, this can leave your credit reserves dangerously low as you go about managing your non-space ice cards. A good thing to keep in mind that the time it takes to get Orion to 0 res cost is the time required to score a 3 point agenda. The first disadvantage of space ice is that it is slow, especially when you have high numbers of them. The second disadvantage of space ice is that it is countered by Femme Fatale, Knight and D4v1d. -Space ice is very slow due to click requirements. Advancing space ice cost you clicks usually spent to gain single credits. -Space ice has some hard counters, Femme Fatale especially is not uncommon. -Wormhole obviosuly combos with any card that has a powerful subroutine, try to splash in some unusual or powerful pieces of ice when you have Wormhole around. Destructive stuff like program trash is allways good but dont forget utility ice like Shiro and Architects first routines. Wormhole can copy Bioroid routines and isnt clickable. Wormholes high strength makes it good for pretty much anything, even just ending the run. For 2 influence Wormhole can be splashed as a 2-of and do tonnes of good work out of faction. -Asteroid Belt is only 6 strength, 1 above Fire Wall, this makes Fire Wall generally the stronger option because it is faster (the difference in is made up for in cost). The two together however makes for some untouchable servers in a Superior Cyberwalls based deck. -Nebula is probably the cheapest no-complications way to get a program trash effect, weakness free, on the table. Other methods are weak (Burke Bugs, Lycan) alternate cost heavy (Archer, Grim) or have some disadvantage such as being trace reliant or clickable (Sagittarius, Ichi 1.0). Nebula shines along with Wormhole since Wormhole can copy Nebulas routine at a higher strength. -Orion has every subtype and can benefit from Superior Cyberwalls or Encrypted Portals. If you get multiples of Orion you can work around the unique limit by using the The Twins. An Orion sitting for a while with 4 tokens on it may cause the runner to think its an Ice Wall or some other piece of advancing ice. Because Orion requires agenda level time investement it is best compared to Archer, archer costs 4 and 1 to deploy, plus whatever amount of and you spent on the agenda, the main difference here is what you gain for the scored agenda, generally the scored agenda is Hostile Takeover or some 1 - 3 that grants a one time benefit, the total cost of an Archer ressed with Hostile Takeover is 7 and 4, but hostile takeover gives back the 7 exactly and makes up for the bad pub by being super tough on the runner pool. This means that Orion is inferior to Archer in terms of tempo. If you run small agendas anyway Archer is the way to go, but if you plant to have as low agenda density as possible Orion is your guy. The two work well together if you have deck space. -Shipment from Kaguya/Shipment from SanSan both let you advance cards when youre low on , use these to "force advance" space ice and agendas to speed up and make up for credits lost to advancing space ice. Matrix Analyzer and Pop-up Window together can create a mini-economy that generates ice advancements for you. Wormhole especially might have a home in Jinteki decks, i've tried it in a Tennin Institute: The Secrets Within glacier variation and it clicked right into place (Chum into surprise Wormhole with a Neural Katana ressed on the table, the runners face when they realize it wasnt an Ice Wall, priceless). Trick of Light can be used to take the useless tokens of ressed space ice. Generally, Space ice fits into a deck that has spare creds lying around, as well as spare clicks, if you include too many space ice you wont be able to ress them all without building around them in your deck. 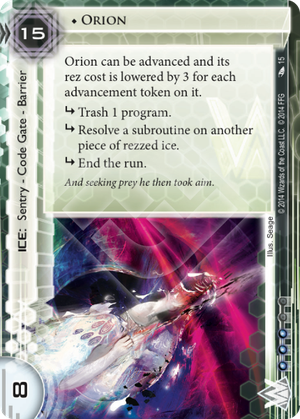 Wormhole especially is a gem and Orion is very much like a super ice with agenda-level effort to get it running, usually best ressed with some card support. Space ice require a time investment that fast decks cannot allocate properly, space ice is much more useful in glaciers.